A very nice looking Balsa wood bridge sent in from one of my readers. 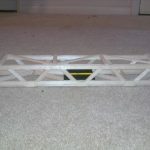 This bridge uses gussets and pin joints and spans 18 inches. 16 queries in 0.325 seconds.